Automatically import subscriptions from OPML format. Integration with Windows Media Player and/or Apple iTunes Playlists. Manages your subscriptions, automatically updating feed locations if they change. Allows you to keep your downloaded media list clean, auto-purging old items. Schedules automatic scans for new podcasts. Maintains library of podcasts, sorted by the feed from which they originated. Catch-Up allows you to mark all non-downloaded podcasts as read, for extended away circumstances. Bookmarking for all podcasts, allows you to return to any bookmarked location anytime at the click of a button. 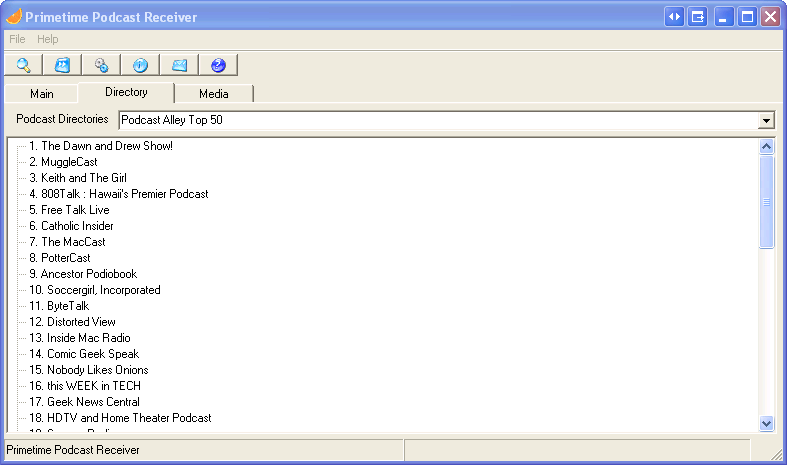 Integrated Podcast directories from Podcast Alley. Plays Windows Media formatted content, using Windows Media Player integration. Progress bar tracks downloads visually. HTTP and Socks (4 and 5) proxy support. Windows 2000, XP, or later. Welcome to Primetime Podcast Receiver! This software will make keeping up-to-date on the latest and greatest podcast feeds absolutly effortless. The Primetime Podcast Receiver will sleep silently in the background while you work, until awoken to do its job by your scheduling. It will allow you to manage your podcast subscriptions and schedule automatic scans for new podcasts. 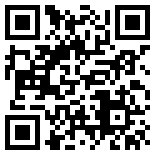 You can also perform a manual scan at any time with the click of a button. 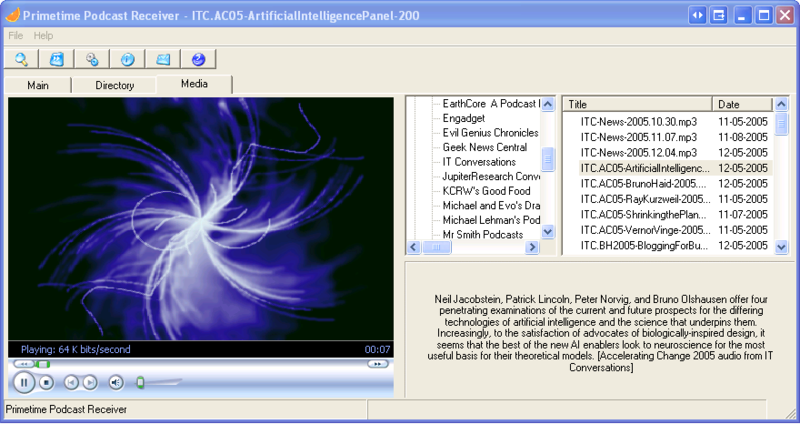 A "Catch-Up" command allows you to mark all of the podcasts as already viewed, so that if the Podcast Receiver is not running for a while, you won't have to download dozens of old podcasts the next time you scan. During the scan, if a new podcast is detected, it will begin downloading automatically, not interrupting you while you work. The Primetime Podcast Receiver was the first software of its kind to allow not just automatic downloading of podcast content, but to also allow you to listen to (or view) the podcast content as well. Using Microsoft Windows Media Player (R) technology, you can listen to podcasts in the background while you work. Primetime Podcast Receiver adds bookmarking capabilities, so that you can always easily come right back to any position in any podcast that you want. We've added the power of Podcast Alley's Podcast Library to provide you with the most comprehensive, fast, and easy subscription mechanism possible. Simply right click on the podcast you are interested in and subscribe! If you have questions, comments, or suggestions, please stop by http://geekswithblogs.net/Lance/articles/PPR.aspx and share. There you will find more documentation about all of the features and configurable options available in PPR. You can also email me for questions or comments. Thanks for using Primetime Podcast Receiver!